It's a reflection of our Western, specifically American, culture that does not permit emotional intimacy between men, or even physical affection, without there being a sexual connotation suspected. In The Lost Boys of Sudan, two best friends who were male walked down the street holding hands and no one batted an eye or thought anything provocative was going on. Once they got to America, they had to quickly correct themselves, lest people think they were lovers. In Arab countries, men still greet each other with a kiss (or kisses) on the cheek. Scripture itself speaks on this, when Paul asks them to "greet all the brothers with a holy kiss" (1st Thessalonians 5:26, emphasis mine). This doesn't play here in the States. Even among family, male-on-male emotional affection is frowned on. A female can openly kiss her mother and/or father or her daughter and/or son. A male can kiss his daughter or mother, but it's rare when a man can kiss his son or father unless the person is either very young or very old. How often have you seen a man about fifty kiss a man about twenty in public, even if it's known they were related? Those men who aren't related who show physical affection will nearly always cause a scandal and suspicion. Admittedly, things are changing slowly, but for the most part men don't go into their innermost emotions with other men. Here is where the comedy of I Love You, Man gets its genesis. We know the bounds of society, and from that comes a wonderful, smart, and funny comedy about men trying to connect to each other in the same way women have for time immemorial while still being "guys". Peter Klaven (Paul Rudd) is a relatively successful realtor who has a wonderful girlfriend in Zooey (Rashida Jones). Though they've been dating only six months, he proposes and she accepts. While she has a whole group of friends to whom she confides everything (and I mean everything), Peter comes to the realization that he doesn't have any close male friends. It isn't his co-worker Tevin (Rob Huebel), a loutish, vulgar fellow. It isn't the group he fences with (as in sword-fighting, not selling stolen goods). It isn't even his brother Robbie (Andy Samberg) or his dad Oswald (J.K. Simmons)--a situation made worse by the fact that Dad considers Robbie one of his two best friends, but does not consider Peter his other best friend. With no one to be his best man, Peter goes on a madcap hunt to find one. He gets help from his brother who works at a gym, from his mom Joyce (Jane Curtin), from the Internet, and from Zooey's female friends who send him to their husbands. Each "man-date" turns disastrous, and Peter comes close to giving up. However, at an open house to see Lou Ferrigno's lavish mansion, he meets Sydney Fife (Jason Segel), an investor who basically crashed the event just to get free food and meet divorceés. Peter is amazed at Sydney's bluntness and they exchange business cards. Some time later, Peter gets the courage to ask Sydney on a "man-date", and the two hit it off really fast--Peter opening up to Sydney about the most intimate details of his private life with Zooey. Soon, Peter and Sydney start seeing more of each other and start building a relationship. This goes over well with Zooey at first, but then she becomes concerned and then alarmed at just how Peter slowly becomes so attached to Sydney than she is becoming secondary. This is culminated at a Rush concert (whom Peter & Sydney both love but whom Zooey has never heard or heard of): the guys are far too much into the music (and each other) to realize she is even there, much to her horror and confusion. This (along with Peter lending Sydney money and him showing some wedding jitters) causes a rift in their relationship, and Peter decides to end his friendship with Sydney and concentrate on the one with Zooey. This, unfortunately means withdrawing Sydney's invitation to be his best man (the whole point of Peter's mad search for a male friend). Soon after Peter obviously misses Sydney, and even though Zooey realizes it and feels bad about inadvertently ending Peter's only real friendship, and even though Sydney misses Peter too, neither man dares call the other. The wedding goes on schedule with Peter's groomsmen being a hodgepodge of men with whom he has the thinnest of connections. In spite of what they've said, Sydney shows up at the last minute to Peter's wedding (at someone's suggestion...won't say who, but take a guess), admitting he was on his way regardless. The story (co-written by Larry Levin and director John Hamburg from a story by Levin) make brilliant use of the roles of men of all backgrounds to create laughs. Even though, for example, Robbie is gay (one of his goals is apparently trying to get straight men to go out with him..curiously with success), he's actually a more traditional, masculine figure than Peter. It's Peter, not Robbie, who makes desserts for his fianceés girlfriends, and it's Peter who loves The Devil Wears Prada. This is counterbalanced by Barry (Jon Favreau), husband to Zooey's friend Denise (Jaime Pressly). He's foul-mouthed, short-tempered, and rude; he's the ultimate macho man, drinking and playing poker and furious that Peter is so inept at "manly" things. In between you have Peter, a nice guy who has an easier connection with women than to men. The performances are first-rate. Rudd is completely endearing as Peter, and he brings a delightful, bumbling interpretation to the role. Take the scene where he builds up the nerve to call Sydney up for drinks--he obviously wants to get it right but still manages to make it sound so comically bizarre. His constant efforts to try to come up with a good nickname for Sydney and his efforts to speak with accents (which he's always told end up sounding like a leprechaun) always make for great comedy. Rudd never makes Peter a figure of mockery but a real person who wants to please. He is the super-ego and Sydney is the id, and Segel is equal to Rudd. Sydney is someone who is in a state of suspended adolescence. He can't quite figure why Peter or any of his other friends from high school don't want to do more things together since he doesn't have the responsibilities of adulthood that the others have. 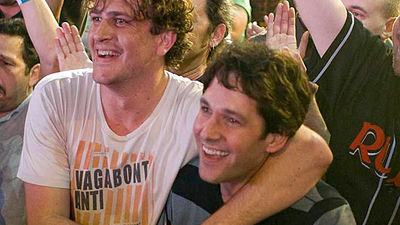 At the heart of the film is a true love story: that between the somewhat timid Peter and the excessively direct Sydney. You can see how different they are just in how they look and behave: Sydney dresses almost always in shorts and t-shirts while Peter is almost always in suits and ties, and while Sydney has no problem acting in public with no restraints to his behavior Peter is pretty much very aware of propriety in public. This yin and yang style between Segel and Rudd works so well, and both of them carry this balancing act without missing a note. Their styles are complementary: while Peter has a hard time letting out a scream, Sydney has no problem trying to fight Lou Ferrigno (who is wonderful playing himself). That should give you an insight into their characters. Jones is also a delight as Zooey. She is completely loving and supportive of her man without being brainless. On the contrary, Zooey is bright and ultimately understanding that Peter should have the same rights in his outside relationships that he has given her. The supporting roles, though sometimes small, are still all around wonderful. Favreau and Pressly as the eternally battling Barry and Denise make an excellent counterpoint to Peter and Zooey, and its their combined vulgarity and combativeness that plays so well. As Peter's parents, Simmons and Curtin add intelligence and a straight-face to just blunt and clueless they can be when it comes to their boys. 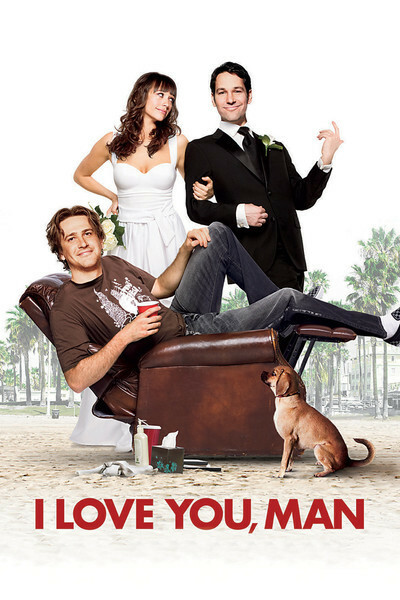 I Love You, Man is a perfect film for guys because it is open (in a comedic way) how in truth men do need each other. It is an homage to the new concept of bromance, where two males can have a close emotional bond and truly be friends without fear of suspicion. Let's just face it: it's very, very funny. The performances never go over the top, the story has a solid logic, and it has a delightful truth at its core: friends are important...whether they slap you a high-five or slap the bass.